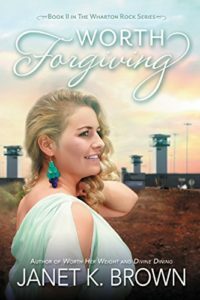 Worth Forgiving by Janet K Brown is a Christian novel about second chances and God’s amazing grace. It is the second book in the Wharton Rock series but can be read as a stand-alone. I had not read the first book but found any background information needed was given. There are many themes in the novel and over them all is God. God is the God of second chances. “God gave you a second chance. He’s got a plan for you.” No-one has ever messed up so badly that they are out of reach of God. God longs for us all to be in a relationship with Him. Self doubt is linked in to the second chances theme. Characters do not doubt God’s goodness but they doubt their own self worth. Forgiveness is a major theme. God forgives our sins and we need to forgive others. Forgiving ourselves is often the hardest. “How could she believe in God’s forgiveness when she couldn’t forgive herself?” This is when we need God’s help to forgive ourselves. Not in our strength but in His. Everyone has a past but in Christ we are a new creation. Old habits die hard and we need to surround ourselves with godly people who will help us move forward into the future that God has planned for us. The theme of God’s grace runs throughout the novel. “If God had given him what he deserved he wouldn’t…” We all need grace that we don’t deserve. Christ exchanged our sins for grace on the cross of Calvary. The theme of searching is present in the novel. Katie spends the novel searching for a place to live and belong. She does not realise that our belonging is not found in a place but in a person… the person of Jesus. People believe words spoken over them. Katie believes she is “Alone. Unwanted. Unloved.” In Jesus she will find herself loved. We all need to hear Jesus’ words of affirmation to us rather than our own words of condemnation. I thoroughly enjoyed Worth Forgiving as I journeyed with Katie from despair into the future. Worth Forgiving was packed full of godly themes and is a compulsive read. I read it in just two sittings… pausing only to sleep! I am looking forward to more from Janet K Brown. Thank you for the beautiful review. I’m honored.